For the past week, Representative Charlie Rangel’s lead over primary challenger Adriano Espaillat has continued to shrink, and today the State Senator spoke out about the situation for the first time, saying, “We cannot have a Florida type of situation in New York State.” We may not have hanging chads (thank God), but the election is turning into our very own Bush vs. Gore, with Espaillat taking his case to court and opening up the possibility of a recount, or even another election. I have received hundreds of complaints of voter suppression, and voters being turned away … We will go to court, and we will go to the final round. I am going to fight to ensure that every single vote is counted. It’s now emerged that, in the initial count, the New York City Board of Elections recorded zeros in 79 of the thirteenth district’s 506 precincts. Many of those districts are in Dominican neighborhoods that leaned heavily toward Espaillat. The candidate said many of his family members found their names weren’t in the election books on Tuesday, and the advocacy group LatinoJustice PRLDEF said an unusually high number of bilingual poll workers were transferred to other precincts that day for no apparent reason. The reports led some to question whether there might have been some underhandedness on the part of the long-serving congressman. DNA Info reports that, on Monday, a judge allowed Espaillat’s lawyers to withdraw a petition seeking court intervention in the count. His lawyers say that they intend to file a broader claim later this week that will allow them to call for a new election. 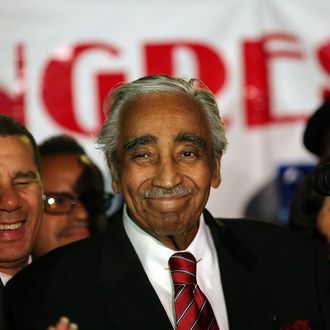 Rangel’s campaign manager says that he remains confident that the congressmen will still come out on top, but just to be safe, Rangel sent out an e-mail to supporters asking them for money to help him fight any court cases that might spring up. While the results are still unclear, there’s one point most parties are agreed on: The Board of Elections is ridiculously dysfunctional. The Times remarks that while its “incompetence” has been “well established” in previous election debacles, “it outdid itself in this primary.” Espaillat called the Board of Elections “broken” and said, “We should just shut it down and build a new system.” Predictably, Rangel’s campaign manager was less critical, but even he admitted, “it would be fair to everybody to have the results election night.” Despite publicly endorsing Rangel, Major Bloomberg couldn’t resist taking a shot at the Board of Elections, which he’s attacked in the past. “It’s about as corruptible a system as anybody could design,” said Bloomberg.